Be the first to share your favorite memory, photo or story of Caswell. This memorial page is dedicated for family, friends and future generations to celebrate the life of their loved one. 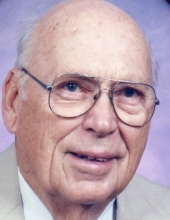 Caswell Willmott, 101, beloved Father, Grandfather, Uncle, and Friend was called to his eternal resting place on March 30, 2019. He entered this world on May 10, 1917 in Paris, KY, born to Charles and Tommie Willmott. Caswell was preceded in death by his wife Jean Foster Willmott, son Barry Willmott, sister Bertha Utterback, and brother Charles Willmott. Caswell is survived by daughter Rebecca (C.T.) Bowman, son Rick (Karen) Willmott and son Randy (Shawn) Willmott, 7 grandchildren, and several great and great-great grandchildren. Caswell retired from American Can Company in 1982 and enjoyed a lengthy retirement during which he played golf as often as he could. He had many friends with whom he golfed regularly in Lexington. He was very active in the Ashland Avenue Baptist Church and shared God's Word while visiting door to door for many years. He showed pride in everything he did and had a very strong work ethic. He was meticulous about his lawn and push mowed it until he was 92 years old. When he turned 100 years old, his birthday was announced and a photo was shown on the Today Show which he thought was very amusing. His family will always cherish memories of him and the many stories he told. The family wishes to express appreciation for the kindness and caring Caswell received from Dover Manor Nursing Home in Georgetown, Bluegrass Care Navigators, and Caretenders. A celebration of life service will be held at Clark Legacy Center, 601 E. Brannon Road, Nicholasville on April 10th at 5 pm followed by a gathering for friends and family until 8 pm. His ashes will be interred in Paris Cemetery in Bourbon County at a later date. In lieu of flowers, the family asks that donations be made to Heritage Baptist Church, 163 N. Ashland Avenue, Lexington, KY 40502. To send flowers or a remembrance gift to the family of Caswell Brown Willmott, please visit our Tribute Store. "Email Address" would like to share the life celebration of Caswell Brown Willmott. Click on the "link" to go to share a favorite memory or leave a condolence message for the family.